New Year Eve @iZAP - iZAP: Helps to find scalable solutions of your application. 31st of December marks the end of the year, but in iZAP, we try to make each moment of the year as special and pleasure-filled as it can ever be. And let me tell you guys that it is true even. We all at iZAP are fun loving folks, who can have fun anywhere and anytime. When there is huge number of people involved, even a small activity can spread a wave of fun and excitement among all. 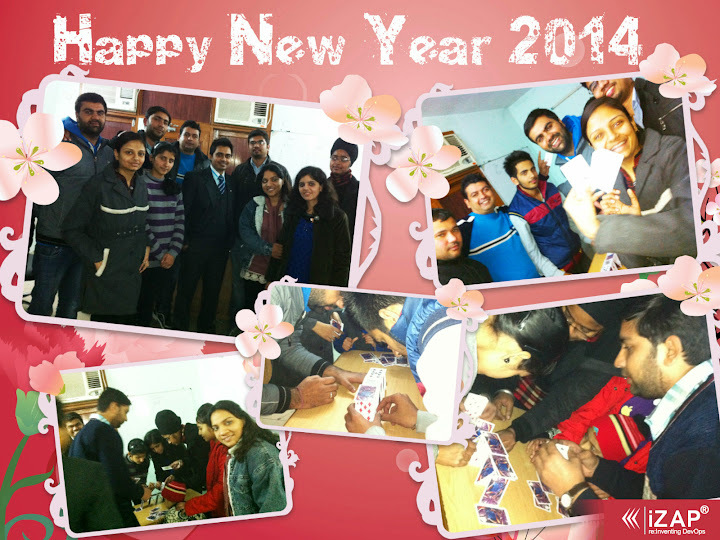 The same happened, when on 31st Dec, 2013 we had activity sessions that was “ONE MINUTE CHALLENGE”. This time, we conducted some team building games and ice-breaking sessions. Since it was the last working day of the year 2013, we decided to bid farewell to the passing year in a humorous way. The activities that we had this time were so humorous, so funny that everybody laughed till their sides ached. After having a delicious lunch, we made two teams that where Team Red and Team Blue. The activities like lemon-spoon race, playing card house, straw bridge, pick with tooth pick, empty the plate etc and many more. It was a very tough competition between both the teams. One by one everyone tried to compete each other in different activities. After 14 games, Oh My God!!! What happened? Can you guess? It was a tie, both teams scored 7 points. So, finally Team Red and blue decided to complete in Push-ups. Shiv and Puneet Sethi took initiative and were very close. Puneet Sethi won and made his Team Blue won too. The Captain of the team Chetan and team members- Shilpi, Ramandeep, Monika, Narinder and Puneet Sethi really did well. That was really an awesome day. Wait a minute! One more exciting thing is left, that was the New Year Bonus. Every iZAPPER was rewarded with the same and their motivation level reached at a great extent. It was a day, which has created unforgettable memories for all of us and we will cherish them for whole of our lives as this party has carved a special niche in our hearts!